Spiritual power comes from your center, your heart, your passion, your hopes and dreams, right? Is inner strength, the soul’s higher power, a byproduct of our compassion, kindness, self-control and upright behavior? Or is it the other way around? Perhaps there is an energy, a frequency and vibration, a spiritual “source code” that is the secret power behind all spiritual thoughts, emotions, and true guidance. This is what Soul Activation, part of The Universal Upward Path series at the Expanding Light Meditation Retreat, wants you to experience: spiritual power as a living, intelligent flame of awakening. Activation is the creative process by which our identity, our bundle of personalities and desires, reaches up to the soul, calling down a powerful flow of love, light, and spiritual intelligence. To call this weekend intensive a “program” isn’t really fair. In truth it’s designed to offer participants a sacred ceremony for greater awakening, a window of opportunity for union, the true purpose of yoga. Yoga-Union is a universal system for integrating and focalizing all vibrations of body, heart, mind, will, breath, energy and soul. 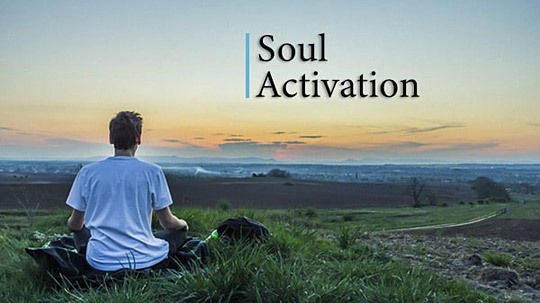 Soul Activation is an opportunity to experience a sacred rite of passage. It holds the space for you to taste the pristine vibration of your higher self. In this space, your spiritual efforts are harvested and your soul celebrates greater connection, showering down intuitive gifts and divine abundance. Most importantly, this is an opportunity to experience a reproducible template to invoke your own soul activation ceremony at home, with friends, in nature, during tough times, sacred moments, or anytime you need the guidance and strength of your higher nature. This experience can also inspire and guide us to practice yoga, or whatever our existing practice may be, in more dynamic ways: as an integral system which cultivates total well being and dynamic strength. The Universal Upward Path is a crystallization of Raja (Royal) Yoga, an ancient framework for holistic awakening and integral mastery. Nothing is excluded from this Royal Union. It includes a complete roadmap for all human stages of awakening, for cultivating higher states of consciousness, for bringing together body, mind, heart , purpose, life-force-action, and soul, to name a few! Many of us already have our own spiritual practice that includes many of these facets of enlightenment. Your Soul Activation experience automatically includes a full spectrum, vibratory awakening, distilled from the many-sided gem of Raja Yoga. It’s particularly powerful to have this experience in a group setting, with an experienced guide, in sacred space, surrounded by a retreat centered in love and light. To be fed and nourished by truth-seekers that see you not only as your personality, but truly as your higher self, helps the heart to quickly open up into its highest soul potential. A variety of experiences and techniques systematically heal, harmonize, balance, empower, and activate this spiritual potential. Learn to consciously feel your own spiritual power as light, as high frequency and powerful vibration, as an intelligent flow descending from above. Reorganize all scattered forces into a single point of light, anchor that point within the heart, and quicken its vibration with a sincere intention to experience your own higher power. Then, energetically lift that intention UP. What comes down in response is the sacred blueprint of the soul, a higher vibratory connection. What comes next is a powerful flow of spiritual awakening: a flood of freshness, wholeness, aliveness, connectivity, vitality, inspiration, new life! This entry was posted in Universal Upward Path and tagged Ananda Yoga, meditation, self-realization, Superconscious Living, Sustainable Spirituality, Yogananda's teachings. Bookmark the permalink.